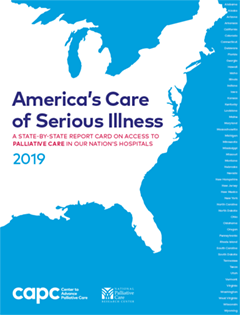 This Report Card demonstrates continued steady growth in the number of hospital palliative care programs in the United States. Access to palliative care remains uncertain, however, and depends upon accidents of geography. Millions of people with serious illness still do not receive the care they need. One-third of hospitals report no palliative care services of any kind, and access to palliative care in community settings (home, nursing home, assisted living) is limited for people who are not hospice eligible (actively dying). Palliative care is a rapidly growing medical specialty aimed at improving quality of life for persons with serious illness and their families. Although palliative care is associated with better quality of care and lower costs, access to it is currently limited mostly to hospitals and, for those who are dying soon, hospice. Making palliative care available to the much larger population of the seriously ill who are neither hospitalized nor dying in the community settings where they receive care is the single largest opportunity to improve value in the U.S. health care system. Patients and families coping with serious illness want and need access to the quality of life that palliative care provides. The timing, demand and opportunity to expand access to palliative care are unprecedented. The public and private health care markets are under pressure to provide higher-quality care for the growing number of aging Americans who face serious and chronic disease. The emphasis on coordinated quality care has stimulated interest among private insurers and health care networks in solutions that are person- and family-centered and have proven cost effectiveness. Public and private health care payers are moving away from fee-for-service siloed payment systems that confound the ability of hospitals, doctors, nurses and other health care providers to coordinate the care they give their patients. Payment changes based on quality of care are pushing communities and health systems to work together to reorganize how and where care is delivered, to reach patients where they live and not just in the hospital. This new environment has led to widespread recognition by payers, providers and other influential stakeholders that palliative care is an evidence-based practical solution to improving value that can be widely implemented. Key stakeholders, including the Institute of Medicine, have recognized a need for additional training in palliative care for most doctors and nurses based on the value this care provides to patients and their families. Barriers to palliative care access remain in three key areas: workforce, research and payment models linked to quality measures. Recommendations for federal policy actions are made on the following page. Lawmaker interest in promoting wider patient access to palliative care is growing. Widely supported legislation pending in Congress would facilitate research, professional development and public education in palliative care. In addition, numerous state governments are developing new initiatives and passing supportive legislation. Interest in expanding access to palliative care is growing. Barriers to palliative care access remain in three key areas: workforce, research and payment models linked to quality measures. Below are recommendations for federal policy actions that could help overcome these barriers. Establish palliative care centers that would develop and disseminate curricula relating to palliative care, support the training and retraining of clinicians in palliative care skills, support continuing education and provide students with clinical training in appropriate sites of care. Establish career incentive awards for palliative care physicians, nurses, social workers and chaplains to foster interest in entering the field of palliative care, and to support clinician educators who can integrate palliative care into medical, nursing school and postgraduate training curricula. Reform Graduate Medical Education (GME) funding to support residency slots in high-value specialties like palliative care, and explore a GME quality-improvement program to create incentive for skills training in patient-centered communication, team-based care and pain and symptom management for all physicians, regardless of specialty. A competent workforce is a prerequisite to delivery of quality palliative care across the health care continuum to the millions of seriously ill patients who could benefit from it. Large-scale training programs are needed to meet a chronic shortage of palliative care specialists and fill a gap in basic palliative care knowledge and skills among clinicians of all types. Millions of Americans are living with serious illnesses such as cancer, heart disease, frailty, functional dependency and/or dementia. This number is expected to increase over the next 25 years as the baby boomer generation reaches old age. However, recent data show there is only one palliative care physician for every 1,200 patients living with serious or life-threatening illness. Historically there has been little focus on palliative care education in medical and nursing schools. The majority of health professionals today have had little to no training in pain and symptom management, skilled communication or helping patients negotiate our health care system. The need to strengthen the palliative care skills of the health care workforce has never been more urgent. Supportive policy is needed to make training in basic palliative care competencies a requirement for all clinicians. Support PCORI, NIH and AHRQ research that focuses on symptom relief, communication with those with serious illness, and developing and evaluating models of care delivery. Support the development of innovative palliative care delivery models. Develop specific program announcements and requests for applications targeted to palliative care research priorities. These studies should include populations with functional and cognitive impairment and frailty. Implementation studies should have a plan for knowledge translation into practice. Develop a Center for Scientific Review (CSR) study section that focuses on serious illness, beyond disease and biology-specific topic areas. Existing study sections that currently review research grant applications related to palliative care should have at least three members with content and methodological expertise in palliative care. Increased funding for palliative care research is needed to strengthen clinical practice and improve health care delivery that will maximize quality of life for patients and families facing serious and chronic illnesses. While the growth of the palliative care field has been remarkable in the last 15 years, there is a need to strengthen the knowledge base that supports basic elements of clinical practice in pain and symptom management, communication skills and care coordination for our sickest and most vulnerable patients. The U.S. Senate Committee on Appropriations, the National Insti- tutes of Health and the Institute of Medicine have called for substantial investments in palliative care research. Research is needed on the recognition and treatment of pain and other symptoms across all chronic disease categories, including cancer, heart, kidney and liver failure, lung disease, Alzheimer’s disease and related dementias. Research is also needed on methods to improve communication about goals of care and treatment options between providers, patients and caregivers, care models that maximize the likelihood that treatment is delivered in line with a patient’s wishes, and care models that improve coordination, transitions and caregiver support and increase the likelihood of a patient’s remaining at home. Allocate funding to develop quality measures that address communication, concordance of treatment with patient preferences and goals of care, and care transitions for those with serious illness, multimorbidity and functional and cognitive impairment, and that are applicable across settings for use in new value-based payment models. Direct CMS to include palliative care measures in all relevant quality- and value-based programs, such as Medicare-sponsored Accountable Care Organization (ACO) measures, the Five-Star Quality Rating System for Medicare Advantage plans and CMS facility–based quality reporting and incentive programs. Measures should include, where applicable, both process and outcome measures to ensure that facilities have adequate resources in place to care for those with serious illness. As CMMI is selecting and piloting new care models, ensure that palliative care is a component of care, quality measurement and payment for those with serious illness. Promotion of regulatory and accreditation requirements, payment linked to value and availability of valid reliable measures are necessary to redress inconsistencies in access and quality of palliative care services associated with geographic location, health systems and ownership, among other variables. State leadership should create a multidisciplinary advisory board and/or task force to conduct a landscape analysis of available palliative care services to determine state capacity and develop appropriate recommendations for improving access to quality palliative care. An advisory board or task force can be created through legislation or by executive order and would coordinate with the state hospice and palliative care association. Conducting a needs assessment and gap analysis is the foundation for strengthening access to palliative care at the state level. State legislatures should direct the appropriate department to create quality standards for palliative care and insert these into the state’s general licensure standards to ensure that palliative care programs operating within the state meet standardized minimum requirements. State legislatures should appropriate funding to establish palliative care training institutes in their states, ideally within an existing university health system, to develop appropriate curriculum, create requirements for training and provide opportunities for hands-on professional development. The institute should integrate this curriculum into undergraduate and graduate courses in medicine, nursing, social work and chaplaincy. The institute should also provide continuing education for practicing mid-career health care professionals. In May 2012, California Governor Jerry Brown established the Let’s Get Healthy California Task Force. Diana Dooley, California’s Secretary of Health and Human Services, and Don Berwick, MD, cochaired the effort. One of the task force’s strategic priorities—Health Across the Lifespan—included palliative care as a key component. Task force leaders built on the work of long-time palliative care champions such as the California HealthCare Foundation, the Coalition for Compassionate Care of California and the University of California, San Francisco (UCSF), Palliative Care Leadership Center to guide their efforts. UC Berkeley’s School of Public Health convened the state’s health system leaders and conducted analyses to identify opportunities to create more value in health care; among the options identified, palliative care was a clear priority. All these efforts helped increase awareness and understanding of palliative care, turning key decision makers into advocates. In September 2014, California enacted a law requiring the Department of Health Care Services (DHCS) to establish standards and provide technical assistance for Medi-Cal (Medicaid) managed-care plans to ensure delivery of palliative care services. The DHCS is holding multiple stakeholder meetings to create standards, identify resources and develop an implementation plan for the legislation. Additionally, in an effort to expand the palliative care workforce, California State University launched a statewide Institute for Palliative Care. The institute provides professional development opportunities through online certificate programs for nurses, social workers, chaplains and other health professionals to ensure that they have the skills they need to provide high-quality palliative care. It also integrates palliative care into thirty graduate and undergraduate courses across its seven partner campuses and has educated more than 2,000 community members in its first two years. In 2003, then-U.S. Senator Ben Nighthorse Campbell set aside a $500,000 appropriation from the U.S. Department of Health and Human Services for the development of a palliative care institute in Colorado, the Life Quality Institute (LQI). Initially a program of the Denver Hospice, LQI was charged with developing a palliative care curriculum for third-year medical students at the University of Colorado-Denver (UCD) School of Medicine. By 2008, it had embedded more than forty hours of required palliative care content and clinical experience into the School of Medicine curriculum. LQI and UCD also launched a unique palliative care rotation for forty physician-assistant students per academic year, comprising twenty-four instruction hours and thirty-two clinical hours at sites providing palliative care. LQI then turned its attention to educating practicing midcareer health professionals and the community. Since 2008, LQI has provided more than 200,000 person-hours of palliative care education to thousands of health care professionals, students and community members throughout Colorado. In 2008, then-Governor Bill Ritter created the Center for Improving Value in Health Care (CIVHC) by executive order. CIVHC identified palliative care as one of its focus areas and convened a multidisciplinary task force to develop eight recommendations to improve access to high-quality palliative care for all Coloradans. In early 2014 the task force, together with the Colorado Center for Hospice & Palliative Care, successfully included a definition of and standards for palliative care in the state’s Hospitals and Health Facilities General Licensure Standards. The standards currently lack an enforcement mechanism, presenting an opportunity for Colorado’s task force to take a next step in its work to increase access to palliative care.